The game of golf was born on rugged, wind-swept land like this. Where every hole, every hazard, and every shot is defined by nature's infinite presence. True links courses are rare, with only about 160 on the entire planet. At Bandon Dunes Golf Resort, you'll find three distinctly different courses built on a beautiful stretch of sand dunes perched 100 feet above the Pacific Ocean. Bandon Dunes and Pacific Dunes feature a dozen holes that run along the bluff overlooking 23 miles of sweeping, undisturbed shoreline. 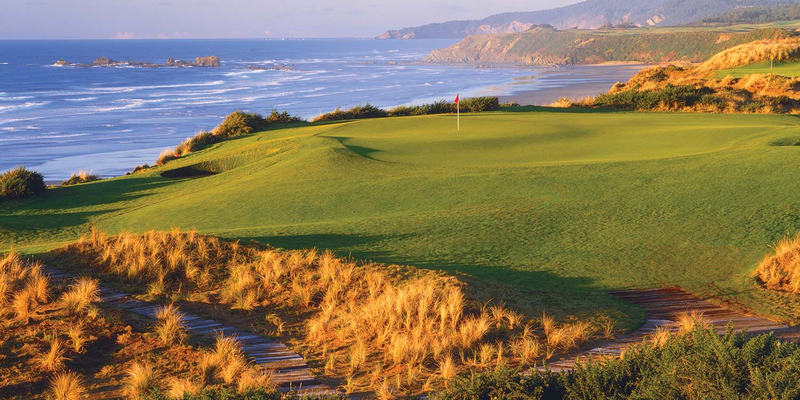 Bandon Dunes, Pacific Dunes - and our newest addition, Bandon Trails - weren't built as much as discovered. Among the coastal forest, dunes and gorse lie 54 golf holes that yield fresh rewards each time they're played. Accommodations provide a refuge of relative seclusion. Chrome Lake Rooms offer double king and two-room lofts. Lily Pond Rooms offer two queen beds, while the Lodge offers single rooms and three suites, many with dramatic golf course views. Our Grove Cottages are designed specifically for a foursome of golfers, with four private rooms and a shared parlor and patio. The new Inn at Bandon Dunes provides single king and double queen beds just a short walk from the Lodge. Located on the property are three full service restaurants, lounges, golf shops, hot tub, sauna, exercise room and locker rooms. A 32-acre practice center allows you to hone every shot required at Bandon Dunes and features a one-acre practice putting green and bunker practice area. Bandon Dunes is 5 minutes from the seaside town of Bandon, just off Highway 101, and just 25 minutes from the Southwest Regional Airport in North Bend, served daily by flights from Portland and San Francisco. Contact Bandon Dunes Golf Resort at 541-347-4380 for more information and details on holding a golf outing at the course. Contact Bandon Dunes Golf Resort at 541-347-4380. Contact Bandon Dunes Golf Resort at 541-347-4380 for onsite or nearby dining options. This profile was last updated on 08/17/2017 and has been viewed 12,428 times.